The common mistake people make when shopping for new contact center furniture is thinking about it as a commodity, purely a price driven purchase decision. Finding furniture in a catalog, getting 3 quotes, and going with the lowest price is often not the best business decision. You need to find a call center furniture layout that will help to improve your business – and Interior Concepts can help. Interior Concepts has worked with thousands of contact centers over the last 20 years. With Interior Concepts furniture and our state of the art design software capabilities, we can help your organization by providing you with outstanding furniture for your MVP – Most Valuable Product (your team). Read about the design process in a prior post, Avoid the Catalog Conundrum. 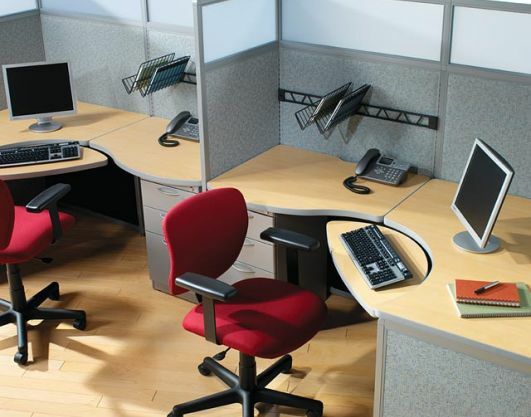 Consider your lifetime cost of ownership in your call center furniture decision. This is an often missed step when considering the price of your furniture. Facility managers often over look the cost of having maintenance personal fix and repair panels and end caps. If your system has a raceway or end cap that is constantly falling off, someone is getting paid to come by and fix or replace these pieces. If you are constantly replacing work surfaces or cantilever mounts because someone used the desk improperly you end up spending more in repair costs than if a more dependable furniture system had been purchased. We love to receive calls from valued customers who purchased furniture from us 15 years ago and want to update their center. We have their original plans on file, can make new modifications and reuse as much of their existing materials as possible. We have helped our customers save huge amounts of dollars by reusing the steel frame and just adding new work surfaces or panels. Over time these customers can keep current with the times knowing they will not need to purchase a complete center. Take a look our testimonials section to see profiles of successful call center furniture projects across the country. Are you thinking about your furniture as an investment or just another purchase? Contact us at 800-678-5550 to start a quote today. Interior Concepts can help you make the most of your furniture investment.